Editor’s Note: Again, this is parody. None of this is real. 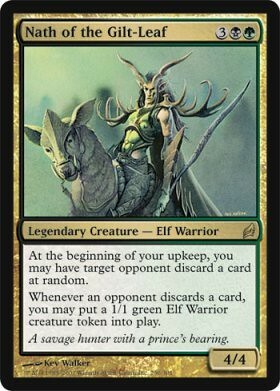 Other examples: After MaRo – I’m not Talking about Treefolk; and After MaRo – An Interview with MaRo about Planeswalkers. Other titles of this post that were considered were: After Maro – MaRo and I share our feelings; After MaRo – No, You Can’t Regenerate a Goblin You Sacrifice; After Maro – MaRo Knows Where You Live and Seen Where You Sleep and He’ll Swear to Everything that is Holy That your Mothers Will Cry When They See What He’s Done to You; and After MaRo – Never Question Bruce Dickinson. Wait, please hear me out, please. Are you going to lambaste me for previewing another +1/+1 creature we used to call a Lord? No, not really. It’s what you said in today’s article. I thought you did a good job explaining your situation. You said you might have made a mistake, and apologized for it. That was very kind of you. No, thank you. I mean, you explained you choices of why you previewed that card and it was very interesting to hear that reasoning. I did not know that, and I’m sure that alot of people outside of Wizards didn’t know about some of the reasons you select preview cards. But you did the right thing and apologize that you might not have picked the best card to start off the Lorwyn previews with. Not everyone apologizes when they make a mistake, and you’re man enough to do it. They were practically asking for pitchforks and your head. So I don’t feel that bad about what I said. At least I knew that you knew what you were doing. That’s something I’ve learned over the years about Wizards. I thought it was dumb to bring back Psionic Blast in the Time Spiral timeshifted cards. Infact, I opened one in the Time Spiral pre-release as you passed by watching for our facial expression. Back then, I thought it was dumb to bring back Blue direct damage, and I thought it was going to warp formats. I still think it’s dumb for Blue to have direct damage, but at least Psionic Blast didn’t warp too many formats, yet. Yeah we’re good. I’ve never been mad at you. Why would I write a blog about something I didn’t like and thought it was going to die off. When I throw out criticism, it doesn’t mean I hate you, it’s I don’t like what you’ve done. I like and respect you. The apology made me smile actually, since you wrote about what I said, and it made me think that you might have read my blog, instead of just what those forum comments said. Anyway, done with the ego trip. So, what do you think of the Elf guy I previewed? Um, Glittering Wish? It’s interesting, but nothing that makes me think of deck ideas yet. I was to wait until the full set is released before then. But I did like the fact that you are trying to make it different than Onslaught. I remember playing back then and it was all mono-colored decks. I played against Goblins and Elves all the time. I played Soldiers. Still think it was alright, but not like Goblins. Something I’ll talk about in a later post. But again, nothing I can say about tribes being in other other colors until I see the whole set. Good. Anything else you want to say? Please, may I have a preview card now?